Home › Canadian Identity › A year of finding Self: SandhuBhamra.com is one today! A year ago, on this date, I launched my blog SandhuBhamra.com – a voice to the internal conflict of finding who I am. I was born and raised in India and started working as a journalist after Grade 12. First a freelancer, I went on to work as a full-time journalist with two leading English national dailies. It was in India, I met my then future-husband, fell in love, and got married. In the fall of 2002, we both moved to Vancouver, Canada. Suddenly, I was thrust into multilayered narratives of being a wife, an immigrant, a person of colour, and a journalist in a new multicultural setting. With time, as I gradually made Canada home, and found work in my own profession, narratives of nationality and motherhood were added to my experience. These started to intersect with the bigger, profound question of finding my real Self. But I kept pushing these thoughts to the back burner, as I focused on family, and career. In 2010, post the birth of my second child; I took a break from an active journalism career. I spent the next two years being a full-time parent, running around two little kids, and intensifying my Yoga practice. When spring arrived in 2012, I knew I was ready to give a voice to the thoughts that had been simmering on the back burner. Soon, on May 21, I launched SandhuBhamra.com, after my double last name – the first band of my layered identity, one that I was born with, and the other, I took on as a wife. For the feminist in me, both last names represent patriarchal order – one that comes from the father and the other from the husband. It doesn’t matter which last name a woman takes – in the end, both dictate patriarchy. I chose to use both names purely for societal identity. For the Self in me, even my first name fails to define me. It is the identity of the Self I seek to explore and understand through my writings. I try to deconstruct identity and belonging by critically examining it through the lens of my personal and professional life, under the categories, Canadian Identity, Racism, Gender Equality, Parenting and Yoga. – As a woman, as to why a woman is judged for the size of her breasts and sheen of hair, and not seen as a person of opinion and intellect. – As a mother, as to why a mother is judged and seen as just a care provider, and not as a hardworking individual who spends her day and night raising impressionable minds. – As a person of colour, where a member of a minority group is negatively stereotyped in the framework of skin colour, and not seen as a regular person with emotions and feelings. – As a Canadian, where a non-White Canadian is seen as an “Other”, with hyphenated identity, and not as a citizen whose culture is a normal part of the national fabric. – And lastly as a human, as to how a person can achieve the yogic wisdom of sameness of inner Consciousness in all that we consider life and non-life, and rise above the perceived duality (Vedanta). Each framework has helped me connect with people like me, or unlike me, who are trying to find an expression for themselves in these narratives. When I get comments, tweets and personal messages from total strangers thanking me for giving a voice to their choked emotions, and giving them a platform to understand multilayered narratives in their own lives, it makes my work, my blog, SandhuBhamra.com, a journey in the right direction. 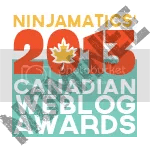 In this one-year journey, my blog has been nominated for Canadian Weblog Awards under two categories: Feminist and Parenting and recently, web magazine Vancouver Mom chose me as the top 30 Ultimate Blogger. Thank you for being with me on this journey. I hope we stay connected, and together understand the essence of being, of Self. Good show. Keep it up. Happy Blog Birthday, Anu! A couple of your points really jumped out at me. Hyphenated labeling, when others are not relegated to such, bugs the heck out of me. And when you wrote that women are judged by their appearance, I had to admit that is less likely for men. Then again, men are often judge by the success of their careers and the size of their annual income. For both women and men, these are false qualifiers in my book. Thanks for your continuous support Tim, much appreciated. Hearty congratulations on completing one year Anu..enjoyed reading whatever you have written so far..happy blogging ..
My pleasure Sudha. Thank you for being engaged. It feels that year has passed so fast. Always enjoy your writings that give different perspective to things. Thanks for being connected Ravy. It’s been a year!!!!!!!!!!!!! Pata nahi chala. Keep writing Anu!